Eternal life is a gift, not a given. If we were to allow the Bible to speak for itself, without reading the long standing human traditions into it, then we would see that in it God promises something to those who believe the gospel. He promises to give us eternal life when Jesus returns. Some people teach that everybody already has eternal life. They believe that human immortality has no conditions – that it is a given. This is the doctrine of innate immortality. An innate attribute is one we are all born with. In this series, we are going to examine numerous passages of scripture. With these texts, I will argue that the doctrine of innate immortality is not taught in scripture. Instead, the texts show that we really do need eternal life, but the good news is that it is available as a gift from God, promised only to those who believe in Jesus. The first question we need to look to scripture to answer is not about the what we humans are made of, and it is not about what our destiny is. The most important question is not about what happens when we die. The first, most important question is about God. What makes God different from us? This is a theology proper question. If we are going to talk about immortality as a gift, we must first determine who is the source of the gift. The Scriptures we look at in this section of our study are going to lead us to two conclusions about the gift of eternal life: First, God is the only one who now possesses eternal life, and secondly, we human beings once had the opportunity to gain eternal life (in Eden), but by sinning we lost that opportunity. Now we will look at our first text. — … God …. [is] “the blessed and only Sovereign, the King of kings, and the Lord of lords, the only One who has immortality, dwelling in unapproachable light, whom none of mankind has seen or can see, to whom be honor and eternal might. Amen.” (1 Timothy 6:15-16 HCSB. This is one of the most important texts in all the Bible on the subject of who God is. It states categorically that God is the only being in the universe who has immortality. Theologians write page after page of God sovereignty, his power and his holiness, and all of those things are also taught in scripture. But when these same theologians come to this text, they either ignore it, or find some way to make it say something it does not say. What does this text say about God? Imagine two hypothetical boxes. The first box is for us to put all beings who have immortality, the second box is for all other beings. What 1 Timothy 6:15-16 says is that only God can reside in the first box. The rest of us do not fit, because we are not qualified. Angels are not qualified. Satan is not qualified. The only being who has immortality today is the supreme being: God himself. Immortality is exclusive to God alone. If you have any questions about this teaching, you can ask me at jeffersonvann@yahoo.com . 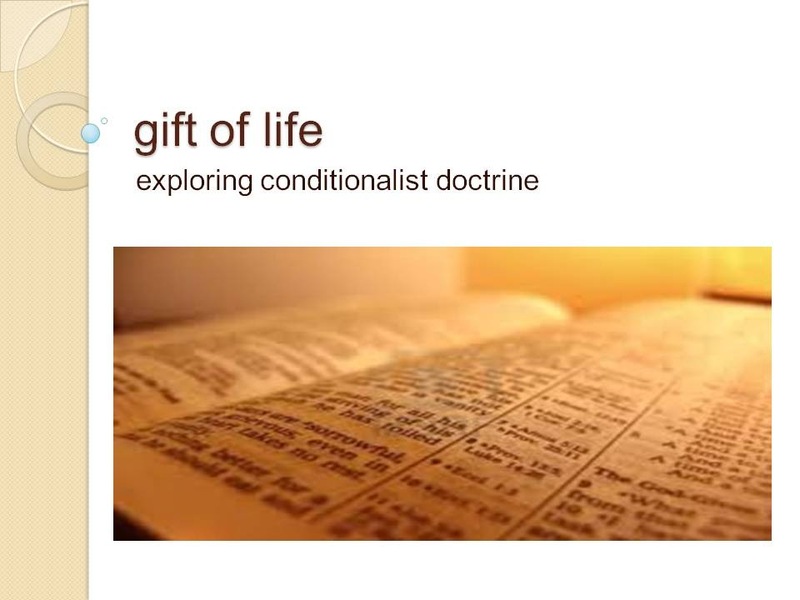 Join me for this entire series as we search the scriptures to learn about the gift of life. This entry was posted in anthropology, eschatology, Theology and tagged 1 Timothy 6:15-16, gift of life. Bookmark the permalink.